To make a localization project public, go to Project Settings, and set Public Project to Yes. You will receive a link to the project's Join page, that you can share to crowdsource translators. 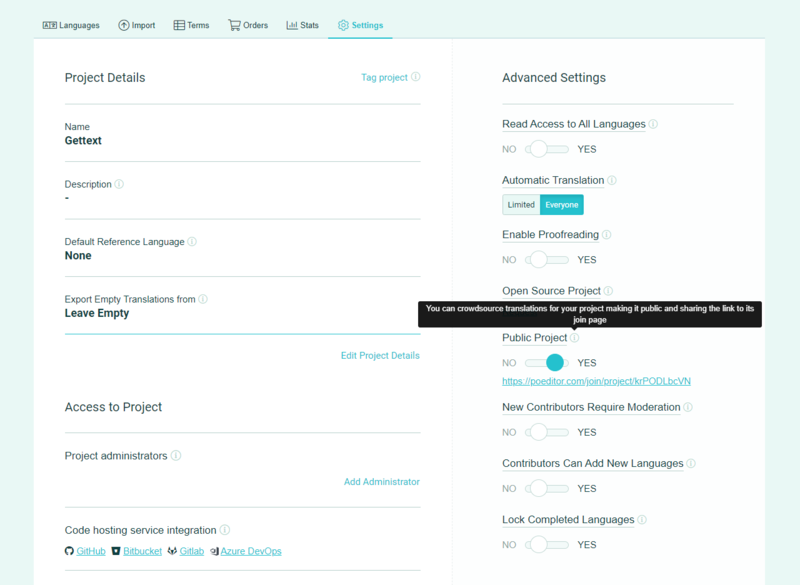 First of all, you have the ability to decide whether contributors joining the localization of specific languages in your public project require moderation or not, using the New contributors require moderation option in Project Settings (Advanced Settings). To control a contributor's access to a language, click on Contributors in the upper navigation bar and use the buttons that appear next to the name of the project. Depending on your settings, you can Approve, Block or Revoke a contributor's access to a language. You can allow contributors to add a language to your public localization project from the Join page. To do this, the owner or admin needs to switch Contributors can add new languages to Yes by accessing Project Settings (Advanced Settings). Also, you can choose to hide the 100% localized languages from the Join page. Look for the Lock Completed Languages option in Project Settings (Advanced Settings). To make public crowdsourcing project private again, go to Project Settings > Public project and select No.